Amazon (NASDAQ:AMZN) is taking bids for a new headquarters, which the company expects to bring an estimated 50,000 jobs and over $5 billion in capital expenditures to the city that wins. More than one commentator has called the situation the Olympics of corporate relocations. Considering that some cities end up regretting the massive outlays involved with hosting the Olympics after the fact, it’s an apt comparison. Amazon announced a fairly detailed list of criteria it is looking for in the search for its new location: a metropolitan area with a population of 1 million or more, a “stable and business-friendly environment,” and the potential to attract and retain talented workers. The company is also looking for “communities that think big and creatively when considering locations and real estate options,” which is more or less code for tax breaks and other incentives. The tech giant is likely to have its pick of suitors. More than 100 cities in the U.S. and Canada have expressed interest in serving as Amazon’s second home base, according to the Chicago Tribune. It is too early to say how many of these candidates will submit the necessary paperwork by the Oct. 19 deadline, and many of them lack essentials such as access to a major airport, public transit options or ample housing for potential employees. But that has not stopped anyone from speculating about a short list of likely winners. One city is making nearly all of those lists: my home city of Atlanta. We’re on Steve Goldstein’s list at MarketWatch and on Conner Sen’s list at Bloomberg. CNN and Recode also both give Atlanta good odds. 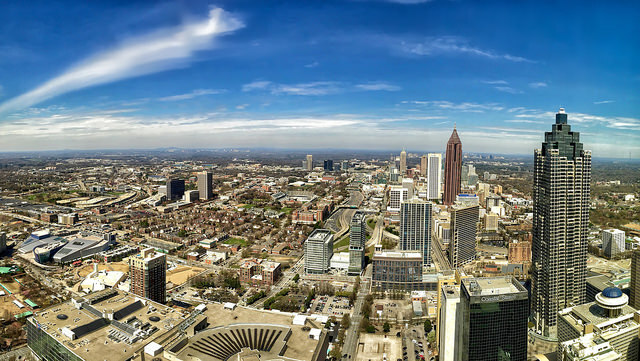 Given Amazon’s wish list, it is easy to see why Atlanta keeps popping up. We’re a big city, with the geographic space for a major new headquarters. Atlanta is home to the country’s busiest airport, and we already have a healthy pipeline of tech talent, with universities such as Georgia Tech on hand to keep it flowing. Like Robinson, I am reasonably confident Amazon would find Atlanta a great place to do business if it won the bidding process. But I have a different question. Should Atlanta want to win? Obviously the infusion of capital and the creation of jobs would be great for the city. But Amazon has not been coy about the fact that “The initial cost and ongoing cost of doing business are critical decision drivers.” How much should a city expect to pay for the privilege of hosting Amazon’s new headquarters in the form of tax credits and other taxpayer-funded perks? Consider Wisconsin’s recent bid for a Foxconn Technology Group manufacturing plant as a potential cautionary tale. The state extended a $3 billion incentive package to the Chinese tech manufacturer in exchange for a promised $10 billion in investment and 13,000 local jobs. In essence, Wisconsin bought those jobs at around $231,000 each. The nonpartisan Legislative Fiscal Bureau has estimated it will take at least 25 years for Wisconsin taxpayers to break even. Sure, some people in Wisconsin loved the deal. House Speaker Paul Ryan and President Trump have lauded it as a major win for American manufacturing. And the state’s governor, Scott Walker, has argued that a successful Foxconn plant could spur more technology and electronics companies to consider moving to or launching in Wisconsin. But critics have expressed their discomfort with the size of the incentives package, especially since Foxconn has already struggled to replicate its success outside of China without rock-bottom labor prices and huge government subsidies. While Amazon’s risks are different than Foxconn’s, the fact remains that cities and states need to carefully consider what they’re buying with the incentives they choose to offer. In essence Amazon has set up a bidding war, one which may lead someone to break Washington state’s record of an $8.7 billion subsidy to Boeing in 2013. Governments should also keep in mind that Amazon is valuable now, but there is no guarantee that it will stay great forever. Amazon has often burned cash in pursuit of growth, and while that has worked well so far, it may not work indefinitely. Even if Amazon stays on top, it may end up automating jobs that today seem firmly safe in human hands. No one knows for sure – but betting big on one thing, whether it’s a city betting on a company or an investor betting on a stock, involves major risk. However this process plays out, Amazon is going to get a lot of money from whatever city it chooses for its second headquarters. Would it be great if the winner was Atlanta? Sure – but not at any price. If the bidding gets crazy, I’d rather my city stay sane and lose. There are a lot of other ways we can invest billions in the city’s future.